Shurpa is an Eastern dish made of lamb with vegetables. 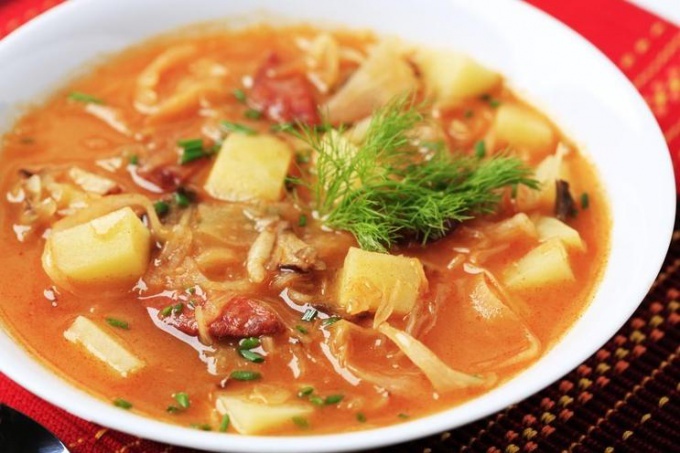 It is a fragrant, rich broth in which the cooked vegetables and meat. Latest when submitting soup on the table serve as a side dish. Broth, vegetables and meat is always served separately in different containers. Especially tasty the soup turns out when cooked in a pot over the fire. In this case, it comes out extremely fragrant and tender. Prepare a large kettle, hang it over the fire and melt it fat. Wash the mutton and cut into medium pieces. Fry meat with spices on the fire until nice and brown. It will take 20 minutes. Remove the mutton pieces from the cauldron. For soup you need to take the spinal part of the lamb. Slice all the carrots and onions in small cubes and fry them in the cauldron with sheep's tail fat until tender. Return fried lamb in a cauldron. Add the chopped tomatoes, eggplant and bell pepper and continue sautéing. Prepare the onion filling. To do this, slice the remaining half onion long, thin strips, add salt, stir. Press strongly with your hands the onions and pour the marinade: mix the water, sugar and vinegar. Pickled onions is a required component of the soup. It will give her a light acidity and break down the layer of fat-tail. Pour into the cauldron water, and simmer the soup for about two hours under the lid. The first boiling remove the foam. The fire the campfire should be small. At the end of the cooking add the potatoes, chopped fairly coarsely, pepper and Bay leaf. Cook for another 20 minutes until cooked potatoes. Add salt to taste. The final chord will be the spices – a pinch of crushed in the palms of cumin, a few Basil leaves, a little ground coriander. Serve the prepared soup on the table in the following way: soup pour into bowls and the meat and vegetables are spread out on separate plates. Definitely serve this dish to pickled onions. It should be added directly into a bowl with the broth and sprinkle with finely chopped greens. Never boil the soup for more than four hours. For this dish suitable only for fresh meat. Even with a well-kept frozen lamb will never get such a bright flavor as fresh. If shurpa meat lay in one piece and not cut it, it will have more flavor and taste.